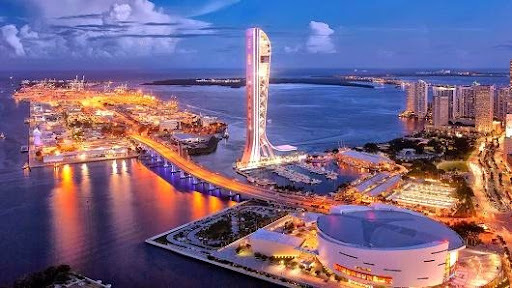 It will rise higher than any structure in Miami, standing at the center of Biscayne Bay. Like the Statue of Liberty, SkyRise tower will be the gateway to U.S. citizenship-not for the tired, poor, huddled masses, but for foreign investors who have at least a half a million dollars to pay. "A significant portion of our funding will come from the EB-5 federal immigration investor program," said developer Jeff Berkowitz, standing in the parking lot from which the tower will eventually rise. "It becomes a very shortcut approach for a potential immigration investor to get their green card. All they have to do is get their source of funds vetted by Homeland Security." The EB-5 program, passed by Congress in 1990 to encourage foreign investment in the U.S. economy, requires each individual investor to commit at least $500,000 to a project that creates a minimum of 10 full-time jobs. SkyRise Miami has already obtained approval under EB-5 and international fundraising is in full swing. Berkowitz obtained $9 million from Miami-Dade County and is seeking more from the state of Florida, but primarily the money for the tower will come from overseas. Berkowitz, who has been developing commercial real estate in Miami for four decades, admits there is, for him, "a certain legacy aspect to this project." He is in the process of committing $30 million of his own money to SkyRise. The 1,000 foot high amusement tower is expected to have a final price tag of $430 million, but Berkowitz said he has no doubt it will pay that back, and more. The structure, rising like something of a hairpin over the Miami skyline, will be erected using three times the steel of the Eiffel Tower and be able to withstand wind speeds of 186 mph, according to its website. SkyRise will include a restaurant, night club, ballroom and private entertainment facility. It will have a several viewing platforms and a so-called SkyRise Drop ride where 12 people at a time can drop 650 feet at a speed of 95 mph. Individuals can also take a "Sky Plunge" on their own, something like BASE jumping from the tower. There will also be a "Flying Theater," where 72 riders can strap in and hang above the city. "We have what I consider to be a tourist attraction deficit," said Berkowitz. "We talk about elevating Miami to new heights." The amusement aspect of the tower will help investors from both China and Dubai relate to the project, at least according to attorneys Shai Zamanian and Preeya Malik with Step America, an immigration-focused venture capital firm in Dubai.